Overfishing, pollution, habitat loss and climate change are the major threats affecting marine life and fisheries. To address some of these challenges and help the efficient implementation of marine and fisheries policies, the provision of accurate and timely data on the diversity and abundance of marine species is crucial. Under the EU-funded SYMBIOSIS, researchers are developing a prototype of a non-invasive system for the characterisation, classification and biomass evaluation of key pelagic fish species. It integrates acoustic and optical technologies without human intervention. The prototype consists of acoustic sensors, a network of cameras, sophisticated data processing units and an energy component permitting autonomous activity. Quoted in a news item, project coordinator Dr. Roee Diamant at the University of Haifa's School of Marine Sciences said: "The system will be environmentally friendly, not only in its operation which will be non-invasive and won't impact the marine ecosystem, but more importantly because it will provide reliable information about the condition of marine fish stocks." Dr. Diamant emphasised that currently, "it's virtually impossible to collect such information without investing enormous resources." The system developed by SYMBIOSIS will collect underwater data in real time over long periods and transmit this information – including the size and movements of the fish stock – to a coastal centre. As stated on the project website: "The system will be completely autonomous and will withstand three-month deployment without recharging." According to the news item, the SYMBIOSIS monitoring process begins with the acoustic discovery and classification of fish, based on their typical speed and movement characteristics. Acoustic sensors also measure the size of the fish and the total biomass of the fish in the area. After identification of one of the six target species, the optical system is activated. This component includes several cameras and can process sophisticated data with various image identification algorithms using deep learning. "When the optical system confirms the identification of one of the six selected species, it transmits the information via underwater acoustic communications, and then by radio communications to a coastal station." The ongoing SYMBIOSIS (A Holistic Opto-Acoustic System for Monitoring Marine Biodiversities) project aims to test the performance of its prototype system in three different marine environments: shallow Mediterranean, deep Mediterranean and a tropical environment in the Canary Islands. The six selected large fish species covered by the project are especially in high demand by the fishing industry. 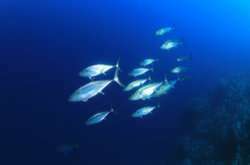 They include two species of tuna, scad (Trachurus mediterraneus), Atlantic mackerel (Scomber scombrus), mahi-mahi (Coryphaena hippurus) and swordfish (Xiphias gladius). Team members note in the news item that SYMBIOSIS "will offer novel solutions to the distributed and large-scale monitoring of the underwater environment, with a positive impact on marine biology research, conservation, and policy making for fisheries in Europe and worldwide."